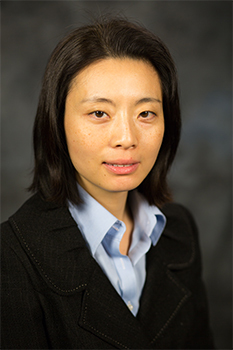 Guojin Gong is currently an Associate Professor of Accounting at the Smeal College of Business. She holds a Ph.D. in Accounting from University of Iowa, a M.S. in Economics from Washington University at St. Louis, and a B.A. in Economics from Peking University in China. Her research interests are in financial disclosure and corporate governance, with a focus on voluntary disclosure and executive compensation. Her research has been published in leading academic journals such as The Accounting Review, Contemporary Accounting Research, Journal of Accounting Research, Journal of Accounting and Economics, Journal of Finance, Review of Accounting Studies, and Management Science. In addition, her research has been featured in Wall Street Journal and other business media. Voluntary Disclosure. Executive Compensation. Corporate Governance. Earnings Management. Gong G., Laura L., "Relative Performance Evaluation and the Timing of Earnings Release." Journal of Accounting and Economics, 2019. Gong G., Shuqing L., "Lenders' Experience with Borrowers' Major Customers and the Debt Contracting Demand for Accounting Conservatism." The Accounting Review, 2018. Gong G., Fang V., Anantharaman D., "Inside debt and the design of corporate debt contracts." Management Science, 2014, pp. 1260-1280. Gong G., Li L., Zhou L., "Earnings Non-Synchronicity and Voluntary Disclosure." Contemporary Accounting Research, vol. 30, no. 4, 2013, pp. 30. Gong G., Ke B., Yu Y., "Home Country Investor Protection, Ownership Structure and Cross-Listed Firms' Compliance with SOX-Mandated Internal Control Deficiency Disclosures." Contemporary Accounting Research, vol. 30, no. 4, 2013, pp. 34. Gong G., Li L., Shin J., "Relative Performance Evaluation and Related Peer Groups in Executive Compensation Contracts." The Accounting Review, vol. 86, no. 3, 2011, pp. 1007–1043. Gong G., Li L., Wang J., "Serial Correlation in Management Forecast Errors." Journal of Accounting Research, vol. 49, no. 3, 2011, pp. 60. Gong G., Li H., Collins D., "Corporate Governance and Backdating of Executive Stock Options." Contemporary Accounting Research, vol. 26, no. 2, 2009, pp. 403-445. Gong G., Li L., Xie H., "The Association Between Management Earnings Forecasts Errors and Accruals." The Accounting Review, vol. 84, no. 2, 2009, pp. 497-530. Collines D., Gong G., Hribar P., "Investor Sophistication and the Mispricing of Accruals." Review of Accounting Studies, vol. 8, 2003, pp. 251-276.